I added a pint of double cream which gave it a lovely rich flavour with the sharp background taste of the Lancashire. The cream had been frozen so had granulated, but as the temperature of the milk increased it blended in with the help of a balloon whisk. Just before I added the rennet I noticed a layer of yellow fat floating on the milk which I skimmed off. When this solidified in the dish I found I had inadvertantly made some butter, or something pretty close. I used it in a cake to good effect the other day, and needless to say, the cheese has all gone. Wow, Jenny, that looks superb. +1 for the recipe please. Thanks for the kind words, I made that one a long time ago, about time I did another! 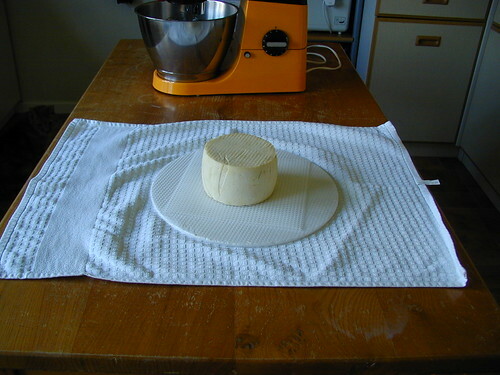 The recipe is in the hard cheese section and is Franco's 7 day Lancashire cheese. I just added the cream because it needed using, but I have made them without it. Thanks Jen. I must get around to trying it.